Interface where you can change the password of your user. We always recommend using passwords with a certain level of complexity, to prevent hacks of brute force. 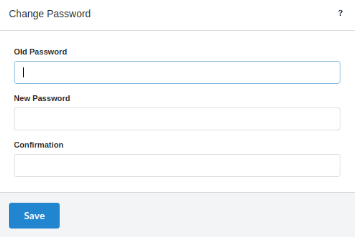 Inform your current password, and the new password twice just to confirm it. For the option of password recovery to work, the administrator need to setup the SMTP configurations correctly in ScriptCase’s settings. Old Password - Inform your current password. New Password - Inform your new password. Confirmation - Confirm the new password.